We have four new additions to the food forest on Gallifrey: two carob trees, and two icecream beans. The icecream beans will need a bit of nurturing through the summer, but I believe that they’re fairly drought tolerant once they’re established. Icecream beans are fairly unusual here. They’re nitrogen fixers, like honey locusts and wattles, and reasonably fast growing. Apparently, the sweet pulp inside the seed pod, between the seeds, tastes a lot like vanilla icecream. I’m not sure how similar to icecream they will actually taste – after all, carob is meant to taste like chocolate, and it sort of does.. at dusk, with the light behind it. But icecream flavoured or not, the pulp of icecream beans is almost universally described as tasty, so I’m looking forward to trying it. In about three years when the trees start the bear. I know this isn’t really exciting unless you’re a massive plant nerd, but I grew roses from seed! I have baby rose seedlings, sprouted from some seeds I collected at my very first permablitz from the prunings of some heritage roses. I have no idea what varieties they were, so my babies are of unknown parentage, and I’ll probably have a long while to wait until I see the first flowers, but even so – how cool is that? Roses. From seeds. From rosehips. There are people out there who don’t know that roses even produce seeds; one of my fellow permablitzers was quite surprised when I explained why I was collecting the rosehips. Although, to be fair, many of the newer varieties are too tightly petaled to be pollinated, or just plain infertile, so they don’t produce hips. In other news, I would like to just say that raspberries are amazingly tough. There was a small mixup in one of my plant orders from the Diggers Club, so they very kindly sent me two free Willamette raspberry plants. Unfortunately, they sent them to my current residential address (an apartment) rather than my plants and packages address (my mum’s place in the suburbs) – so the package got sent to my local post office, and I got a package to pickup notice in the post. The post office then proceeded to lose my package; they couldn’t find it when I went to pick it up, claimed the notice was probably for a package I had already picked up, and said they’d call me when/if they found the missing parcel. As I didn’t realise that the package in question was the raspberries, I left it with them. 3 weeks later I got a phone call to pick up the package which they had finally found. Only then, when i picked it up and saw the “LIVE PLANTS” notice on the box did I make the connection. I opened the box, fully expecting to find dead sticks. After all, these plants had been in a cardboard box with no water or sunlight for at least 3 weeks. To my surprise, they weren’t dead. The poor things had started trying to sprout, sending these pale yellow-white tendrils outward, desperately seeking food and water. They looked like ghost plants. I gave them some water and put them on the balcony in the hope that they might survive with some nurturing. They not only survived – a week later they were green and thriving. So I can only say again, raspberries are tough, and Diggers obviously grow super healthy, resiliant plants (an observation also borne out by other live plants I’ve purchased from them). A++ would buy from again. It’s tough, resisting the desire to plant all the fruit trees as soon as possible. We’ve planted a few, but only the tough species which can take our WA summers without too much coddling. Figs, pomegranates, honey locusts, natal plums, a mulberry. Dates and carob will go in soon, and possibly a quince and a few olives. To make up for that patience, though, we are going a bit crazy planting support species. Mostly that means wattles and a few black locusts, Persian silk trees, and pepper trees. But it also includes oaks. Oak trees aren’t the first “support” tree you might think of for Perth, but they’re actually tough as nails once they get established. They also make very good shelterbelt trees, being fire retardant and wind resistant. I collected some acorns from a local park the autumn before this one, and grew them up. 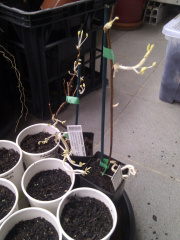 We’ve got three baby English Oaks planted out already, and another four on the balcony, waiting for planting. I’m also planning another acorn gathering expedition, to grow some more seedlings. That’s not all, though. 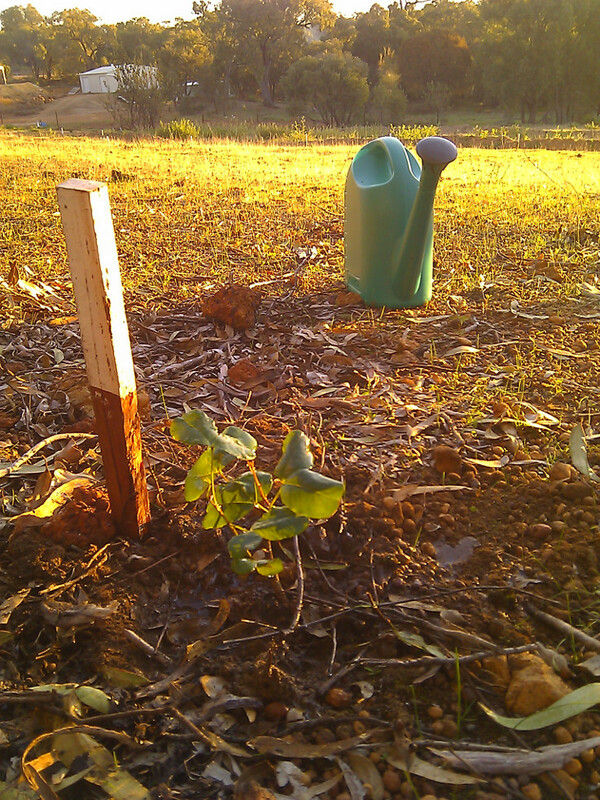 My latest present to myself was two cork oak saplings from Diggers, which arrived in the post last week. 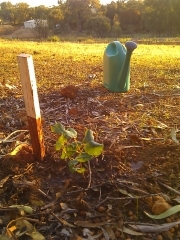 We planted them out on Sunday. Eventually the plan is to have a small cork oak woodland in the far corner of the block, which will be beautiful, low maintenance, mostly fireproof, and potentially produce a valuable crop of cork in about ten or fifteen years. Roselle, better known in Australia as Rosella (like the parrot, but less feathery) is an annual (or sometimes biennual), fast growing shrub in the hibiscus family. Like most hibiscus and mallows, it has edible leaves and flower petals, but Roselle is most famous for its edible calyx. The calyx, stems and leaves are acid and closely resemble the cranberry (Vaccinium spp.) in flavor. The calyx is used to make jams and sauces, and dried for tea. The tender young leaves may be cooked and eaten as a substitute for spinach, though somewhat spicier in flavour. Young roselle shoots, leaves and calices are traditionally used as a cooked vegetable or finely cut and used in sauces in Africa. The leaves and fresh green calices are used to make a soup, which is rather mucilaginous in texture. Fibre from the stems may be used as a substitute for jute (fibres produced from the stem of Corchorus species). 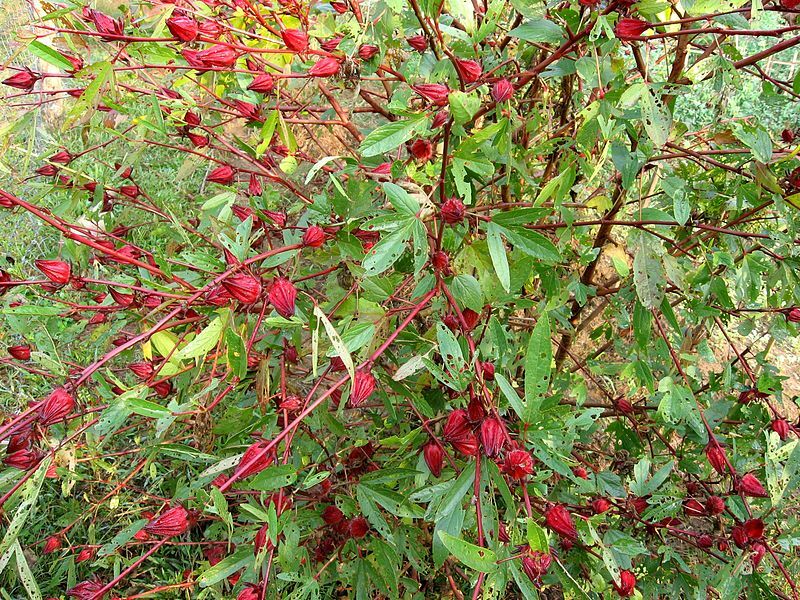 Roselle grows into a small shrub, up to 2.5m tall, with smooth or nearly smooth, cylindrical, typically red stems. The leaves are generally lobed, with 3 – 5 points, and have distinctive reddish veins. The flowers are white to pale yellow with a dark red spot at the base of each petal, and turn pink as they wither at the end of the day. They are usually self-pollinating. 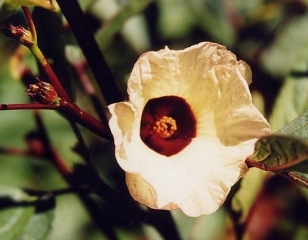 The flowers have a stout, fleshy calyx, usually bright red, at the base, 1–2 cm wide. 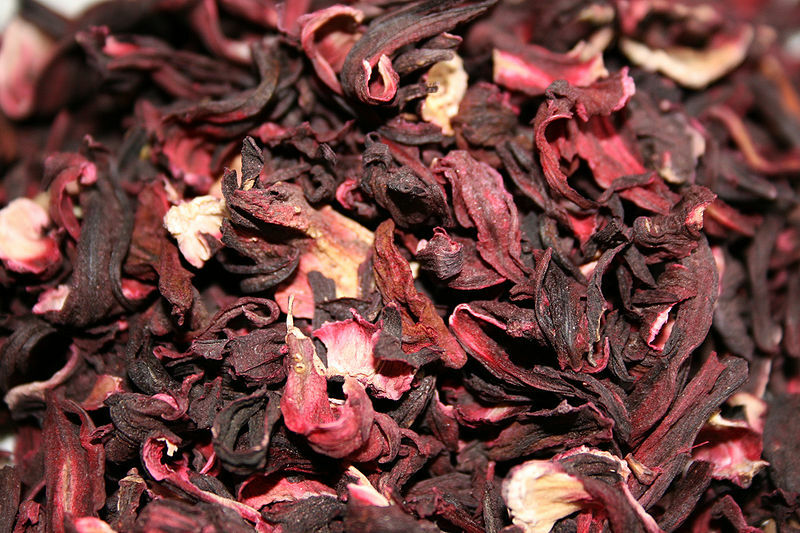 This becomes more prominant, crisp, and juicy after the flower has withered and while the fruit matures. This enlarged calyx fully encloses the seed pod, which is 1 – 2 cm long and green when immature. The mature seed pod is light brown, with 5 valves or segments, each of which contain 3 – 5 kidney-shaped, light-brown seeds. Roselle grows easily from seed. 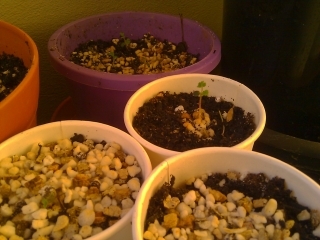 The seedlings grow quickly, reaching about 30cm in height after 1 month. The plants goes through a 2 – 6 month vegetative growth phase before flowering begins. 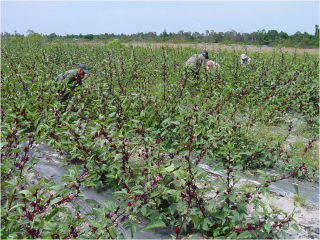 Leaf harvesting can begin 6 – 8 weeks after the seedlings emerge, and stimulates branching and leaf production. Seedlings may be raised in nursery beds and transplanted when 7-10 cm tall, but seeds are usually set directly in the field, 4 to 6 to a hill, the hills 1-2 m apart in rows 1.5-3 m apart. 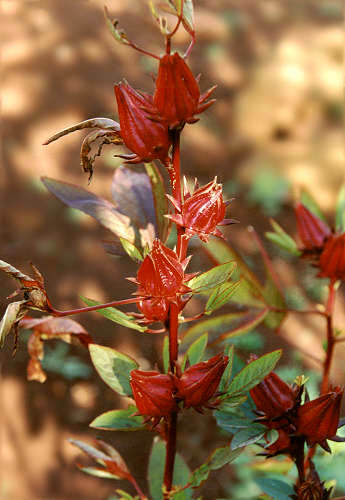 Roselle is often intercropped with other crops such as pearl millet, sorghum, groundnut, sweet potato, yam or cowpea. Roselle is susceptible to most diseases affecting cotton, and root and stem rot caused by several Phytophthora spp. lead to plant losses. Plants reach maximum productivity in their first growing season, but can be pruned to achieve an early, although less substantial, harvest in their second year in subtropical climates. The fleshy pods are best removed when they can be picked easily from the bush by hand while they are still young and crisp; as the seedpods mature the calyx becomes tough and stringy. Once picked, the next task is to remove the calyx, the fleshy petals, from the seeds. It is a little time consuming, but they peel off quite easily. Use gloves because they seeds are prickly. The green seed pods are high in pectin, and can be used to assist in jam making. The tea is very similar in flavour to rosehips and high in Vitamin C. To make it, strip off the red calyx and dry it in the solar dryer or a slow oven until leathery. Only two small pieces are needed per cup of hot water. Try mixing it with dried lemongrass, lemon verbena and dried organic orange peel, or with ginger or mint for a wonderful herb tea. It is also good as an iced tea. Place the seed pods in a saucepan, cover with water and bring to the boil. Simmer for around 40 minutes, or until the liquid becomes thick and gelatinous.Make sure the pods don’t break open. Strain through a sieve or cloth to recover all the liquid. Put the liquid aside for use later, discard the pods. This process extracts pectin from the seedpods to help the jam set. Pour the liquid back into a large saucepan, add the red calyx, apple & lemon and simmer gently until they are very soft. Measure this fruit pulp and add cup for cup of sugar for each cup of fruit pulp (or for larger amounts, 1 litre of fruit pulp = 1 kilo of sugar). Stir over a gentle heat until the sugar is completely dissolved and then bring to the boil. The jam will froth high in the saucepan and so needs to be no more than half full before you start it boiling. Test for setting by putting a saucer in the freezer to chill, then put a teaspoonful of jam on the saucer, wait for it to cool slightly and then push the top of it with your finger. If it crinkles it is cooked. Another sign that it is setting to watch for is when the jam stops frothing and settles down to a hard boil. As the jam reaches setting point it is also most likely to stick and burn so pay close attention and stir often. Remember that the setting of a jam is a chemical reaction between the fruit acid, the sugar and the pectin, not an evaporative process. Jams set as they cool, if over-cooked the setting point may be passed and instead a thick syrup rather than a gel is formed. Water – Roselle thrives in areas receiving 800–1600 mm of continuous annual rainfall, and requires a minimum of 100–150 mm/month during vegetative growth, or 300–400 mm distributed over a period of 3–4 months. Dry periods during the final months of growth promote good calyx production, while excess precipitation or humidity can lower the quality of the calyces. Sunlight – Roselle is a photoperiod sensitive plant that flowers best when the daylength is shorter than 12 hours. It requires 13 hours/day light during vegetative growth to prevent premature flowering. Roselle prefers a full sun position, but will tolerate afternoon shade. Soil – The crop can grow in a wide range of soil types, the best being retentive, friable loams. 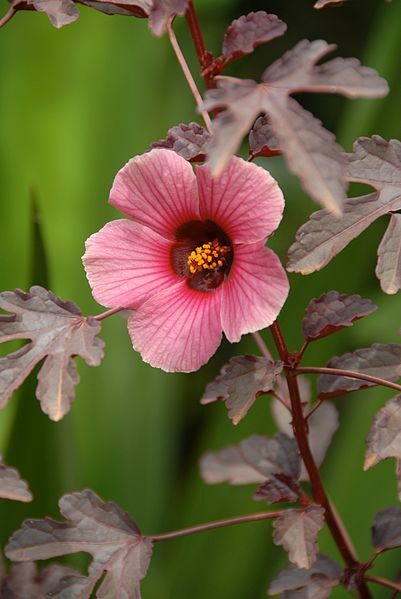 Space – Having a deep root system, roselle requires adequate soil depth and is rather drought resistant. Warmth – Roselle has temperature requirements ranging between 18ºC and 35ºC. 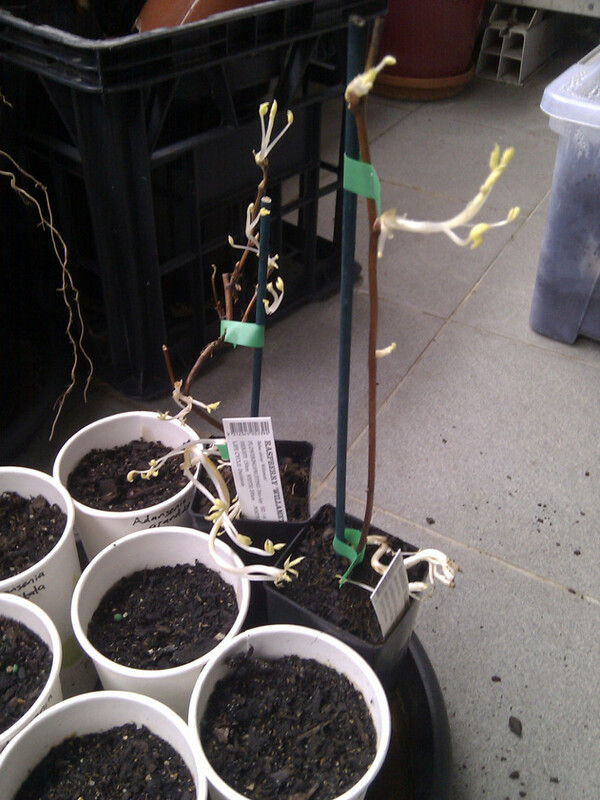 Plant growth stops at 14°C, with death occurring after 15 days. At 10°C, death occurs after only 2–3 days. Flower and calyx production is reduced at temperatures below 17°C. Cotyledons cannot withstand temperatures below 10°C for more than 2–3 hours. Edible leaves and flower calyces (“fruit”). Seeds, which can be grown into more roselle plants. Albizia julibrissin, known variously as the pink siris, the Persian silk tree, the sleeping tree, or (incorrectly) as a mimosa, is a common ornamental garden and street tree. It has a graceful, elegant shape reminiscent of a jacaranda or acacia, with smooth light brown or grey bark and feathery, bright green leaves. 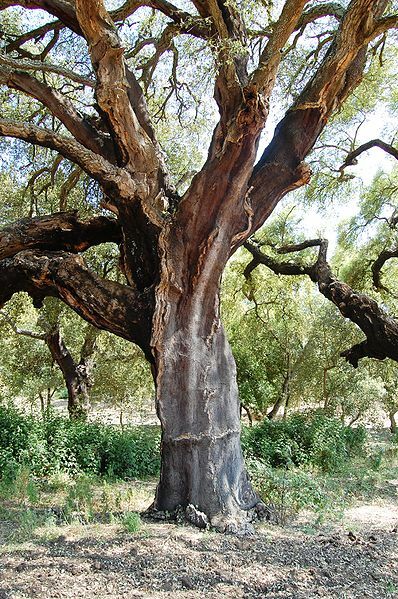 The tree grows up to 12m tall, with an open, umbrella shaped canopy, providing dappled shade and allowing enough light through for other plants to grow underneath the tree. At night, and during periods of rain, the leaves close up as if the tree is sleeping, leading to the common name ‘sleeping tree’. It is also deciduous, losing all its leaves over the winter even in areas with mild winter temperatures. 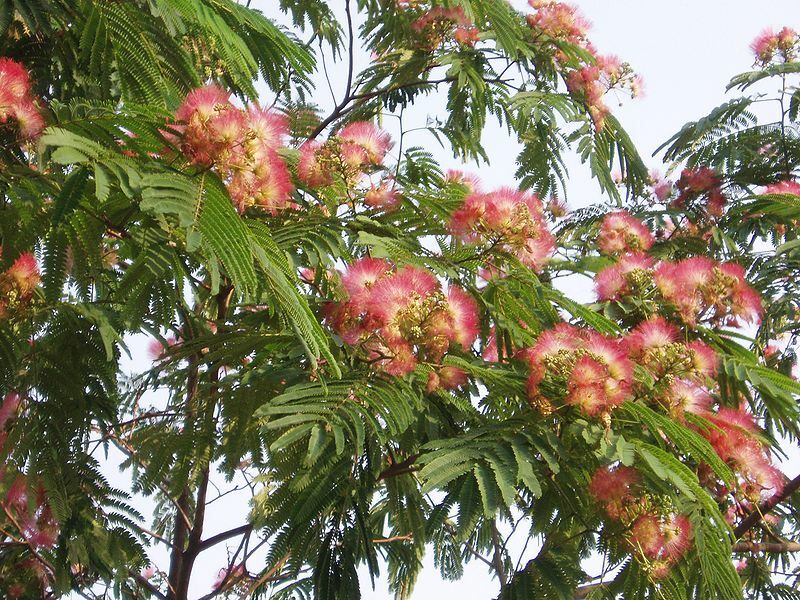 The flowers resemble pom-poms of silk threads, which appears to be the origin of the name ‘Persian silk tree’. They have no petals, and consist mainly of a dense cluster of stamens. They are fragrant, light to dark pink, and arranged in loosely branched, pyramidal flower clusters at the ends of the branches. 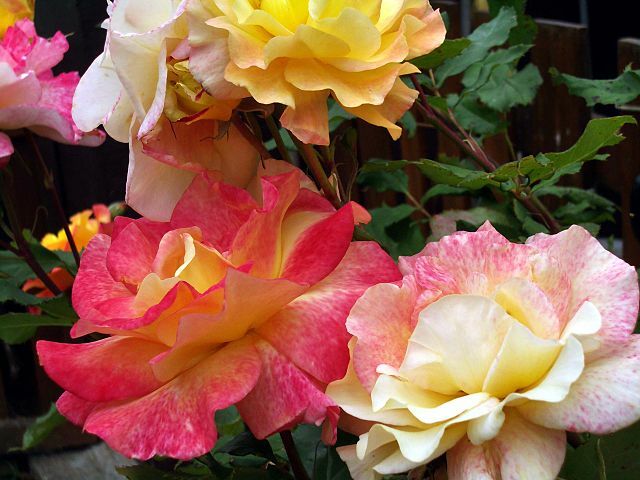 The flowers are attractive to bees, and to nectar feeding birds including hummingbirds. Fruits are flat seed pods 12 – 18cm long, containing light brown, oval-shaped seeds. These pods are gray-brown when mature and remain on the tree into winter. The seeds and foliage may be used as a food for livestock and wildlife, although care should be taken as the seeds may contain some levels of toxic amino acids and saponins. 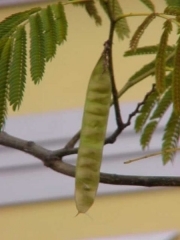 Silk tree seeds have impermeable seed coats that allow them to remain dormant for many years. One study showed that 90% of the seeds were viable after 5 years. Treatment with boiling water or sulfuric acid decreases the germination time, but germination rates are high even without treatment. Seedlings transplant readily, and are very adaptable. Pink siris is found in disturbed areas, including coastal and urban areas. It functions as a pioneer plant; it is drought tolerant, wind tolerant, and will tolerate both salinity and alkalinity in the soil as well as salt spray in coastal areas. It will also resprout strongly when damaged. Pink siris is frost tolerant, but prefers areas of high summer heat. It has been used for land reclamation because of its ability to establish itself on marginal sites. In spite of this, pink siris trees often die at a relatively early age due to fungal diseases (specifically mimosa vascular wilt, a form of fusarium wilt), to which they are susceptible. 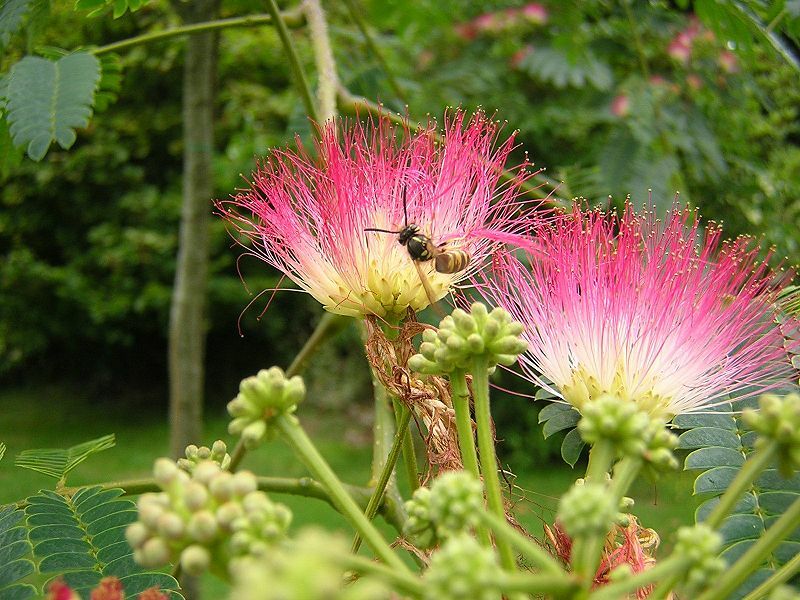 A tea made out of the flowers of this tree is used in traditional Chinese and Korean medicine to ward off confusion and dark feelings; a clinical study by Korean physicians found that the methylene chloride fraction of Albizzia julibrissin extract produced an antidepressant-like effect in mice. Further research is needed to verify this effect. Water – about 1000mm rain or irrigation annually. Sunlight – In its native range, A. julibrissin prefers open sunny ravines. Soil – Prefers sandy loam-medium loam soil and can withstand high soil pH and salinity. Fodder for livestock – the foliage meets the nutritional requirements of cattle and domestic goats, with similar digestibility to alfalfa. In a domestic sheep feeding trial, mimosa digestibility was 61%, and there were no signs of toxicity. The tree tolerates 2 complete defoliations during the grazing season. Nectar for honeybees, other insects, and birds. Erosion and salinity control – Pink siris is cultivated on terrace edges in the Himalayas to prevent soil erosion. It will grow in marginal areas, and tolerates salinity and poor soils. Reclamation and soil improvement – Withstands drought and can adapt well in arid conditions. It is a nitrogen fixing legume, and provides plentiful leaf litter to improve soils. Shade and shelter in the garden. More pink siris trees, which grow easily and quickly from seed.